Please have a look through these few rough cover designs and tell me which you like the best and why? Any suggestions for different elements to combine, and if you dislike any elements that shouldn’t be included. Despite the book being 2,500 years old, I don’t really want spoilers on the cover as the idea is that people who don’t know the story will be reading it. That’s why I thought having Esther as a silhouette or not a queen would be a good option. WHY DO WE USE PATREON? HOW CAN YOU SUPPORT THE PROJECT? 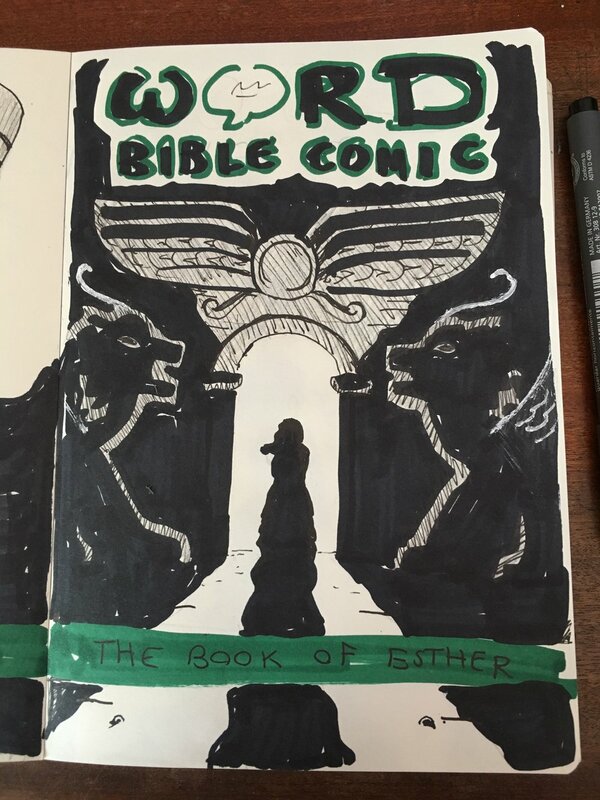 In this blog I'm going to talk a bit about why we want to use Patreon to help fund the Word for Word Bible Comic. Firstly lets share our vision for the Word for Word Bible Comic, we believe that through presenting the unabridged bible in a graphic novel format will open up the word of God to those who might never have looked inside a standard bible. Our hope is that in doing this many will come to a better understanding of God’s word and therefore a more open heart. Our hearts are all for this mission and we celebrate that we get to work on this project everyday however we need funds to keep the project going and there are a number of way that we can do that. We manage the money we get from the Kickstarters extremely carefully, but there's no slack, for example, there's not enough money to hire in an admin person to fulfil orders or handle social media, so it comes down to us, (that’s me, the artist, and my wonderful wife and sometimes even our two young boys). With regular funds through a platform like Patreon it can take some of the pressure off. A regular and reliable income means we can plan. We could hire an extra colourist to help complete new books faster. We could pay for some advertising to reach people who don’t even know these books exist yet, which in turn would lead to more sales and so the effect snowballs. 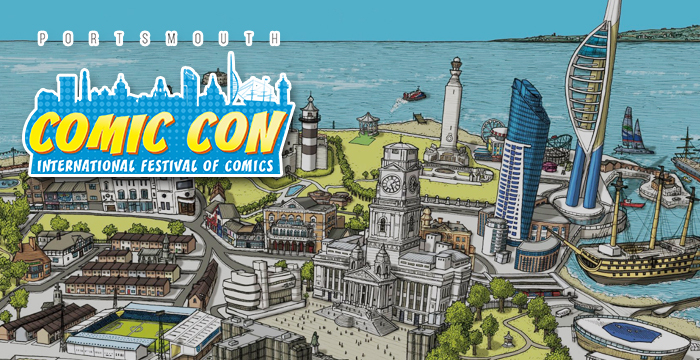 We could book into more events (conferences and comic cons) and talk to people about the books face to face. 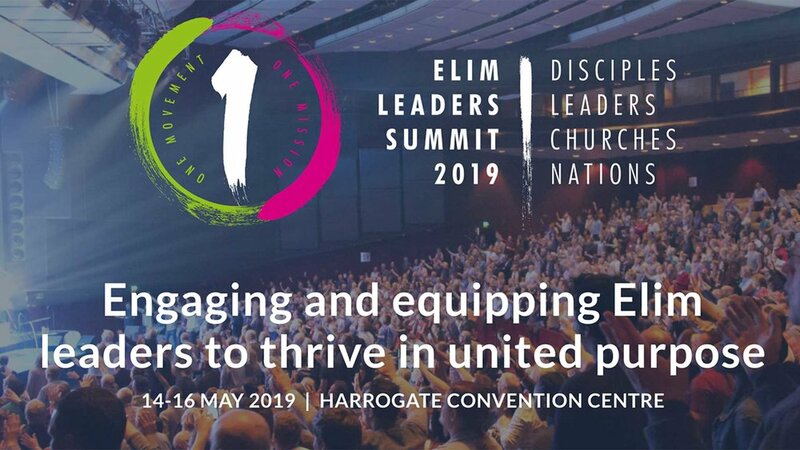 As an example of this, we'd love to run an advert in the handbook at UK's biggest youth and youth leaders event, but it costs £900 ($1,200) and so we just don't have the breathing space to put the investment in, even if it would lead to long-term gain. At this time the business is growing at a healthy rate. We are gradually getting more and more followers and sales through new channels that are opening up all the time, like suppliers for book shops and greater reach on platforms Amazon, Kindle and Comichaus etc. We have been so blessed with the patrons and supporters we have, and we sense that we are at a tipping point where we could grow the business greatly with a little more investment here and there, which could bring exponential growth. If you have been following our posts on social media over the last week or so you will know that Patreon, in a similar way to Kickstarter, offers rewards and privileges so we hope that there is something that might interest you. Also for every Patreon who wants it, your name will be listed as a supporter in the books! We are super keen for fans to become patrons even at the lowest level. Here are a few reasons that even a $1 monthly pledge can be a big help to us. Firstly, of course, every little helps. Secondly, as a patron you are able to see some of the work before anyone else and can give valuable feedback and comments, even join the patron hangout quarterly. Thirdly, on Patreon the search function is ranked by 'number of patrons', so your backing raises our profile and will help us be discovered by other people browsing for interesting projects to support. If we can get to 55 backers we will be the sixth highest Patreon on the seach "Bible" and one the first page of "Comic". I'm quite pleased that we have passed "Drunken Bible study" on the rankings already. Check out the page for all the options! Now I know that for a lot of people even a $1 patronage would be unviable but there are still a number of ways to support the project. 1) Add a review to the books on Amazon and Good Reads. A massive help for ranking and customer confidence. 2) Follow us on social media and regularly like and comment on posts to help them get more prominence. 3) Pray! Please do keep us in your prayers, please pray for our provision and guidance into making the comic as accurate as possible. In this image (now in colour), we can see some of the Greek troops who fight against Xerxes at Thermopylae, which features as a brief cut scene in the book of Esther. 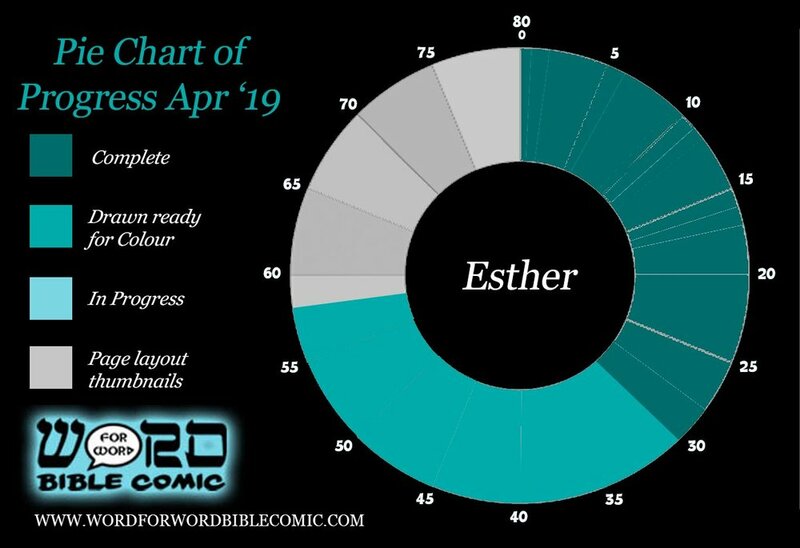 KICKSTARTER BACKER NOTE: All backers who are due to receive digital copies of Esther as it progresses, will be getting the first instalment sent through very soon! This image and the rest of the page was released to our patrons recently. In order to make it to March 2020 without a Kickstarter, we need your help and so we'd love you consider becoming a monthly patron of the comic! Aside from supporting us, you will get access to pages before anyone, be part of the creative process from just $1 a month! Have your Say: What book do you want to see? I am currently running poll on Facebook for you to give your opinions on which book you think we should do after we've completed Esther and then done another Gospel. We'd love you to vote and to leave comments about which you think would be the best and why. 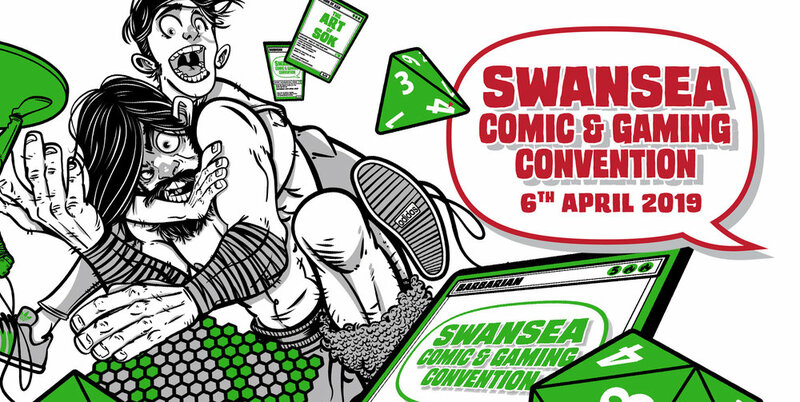 On the 6th of April, I will have a stand at Swansea Comic Con! It's another event I haven't done before so I'm hoping it will go well and meet lots of new people. The artwork has been progressing steadily and the colouring is coming along. Page 45, that I have just been working on, is the start if Chapter 6 in the book. Firstly, please pray for Ryan the colourist who has injured his wrist and is currently unable to colour. Pray he recovers well. Please also pray for Leslie, the other colourist who has applied for another day job which will hopefully have her more time to work on pages for the comic. Lastly, please continue to pray for God's provision to meet our needs financially in order to keep progressing well with this project, and that we can continue to build his Kingdom with the work. Meeting your heroes: Glenn Fabry artist of Sláine and more. He liked that I’d done an homage to his wrk and he told me a funny anecdote about that short comic. He said he’d been drawing Sláine day and night so much, at the time, that he’d started dreaming about it too. When he told Pat Mills (his editor) about this he asked him what the dream was. Glenn told him the premise that it starts with a fly sat on an open eye, it pans out and there are several bodies, it pans out more and there’s a pile of them, panning across there are thousands of bodies lying in mountains, then at the end it pans onto Sláine just standing with his axe. And Pat Mill just said “great you should do it”. Glenn said that he did so and was really pleased as when it came out he’d also be credited as the writer for it too. But then, at the least minute, Pat’s wife, Angie Mills, said “At the end it should say ‘He didn’t think it too many’” and as a result she got credited as the “writer”, and Glenn was like, “It was my £#€<ing dream!”. Here’s a picture of him with my book, he was really pleased…honest. 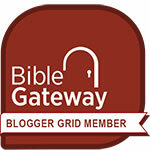 Sign up with your email address to receive news, offers and updates about the Word for Word bible Comic. WHAT BOOK DO YOU WANT TO SEE NEXT? Once I have completed Esther I plan to produce Matthew's Gospel, God willing. After that, I can tackle a new book, potentially a longish one. Two of the top contenders would be Acts or The Book of Revelation. But let's hear which Books you'd like to see? Considerations: I will have already done Judges, Joshua, Ruth, Mark, Esther and Matthew by then, so which books may go well with them? Many key characters have been pictured already within these books and this could help the creation of the next book. Some books are too long to fit in one volume so Genesis, for example, will likely have to come out in three volumes, Exodus or 1 Samuel in two volumes and so on. One day I may do the prophets but this will be after I do the history book (Kings, Chronicles etc) which covered the time period they prophesy into. You can vote on the poll on Facebook in our group. I'd love to see comments about why that would be a good option. Feel free to add suggestions to the poll. This month, Have your say, watch research videos and get the latest news about another Jesus related comic from DC! Here's a sneak peek of Vashti's party from the Book of Esther. This is just one of the panels released to Patreon patrons of the comic, who receive 8 pages a month. DC's Vertigo imprint was all set to publish "Second Coming" in March this year, which depicted Jesus as returning to earth to be a superhero after "his failure" the first time around. I was among those who created a blog and shared the petition against it. Now with a quarter of a million people having signed the petition, DC has wisely decided to cancel this imminent release. So there you go, sometimes petitions prevail. Read the blog and don't miss your chance to give your opinion on this topic. A couple of weeks ago, I had a stand at True Believers Indie comic con, and I met many of you Troobs there! (It's just a coincidence that it sounds like a Christian event). I had a great time, here's my stand and welcome card from the organisers. 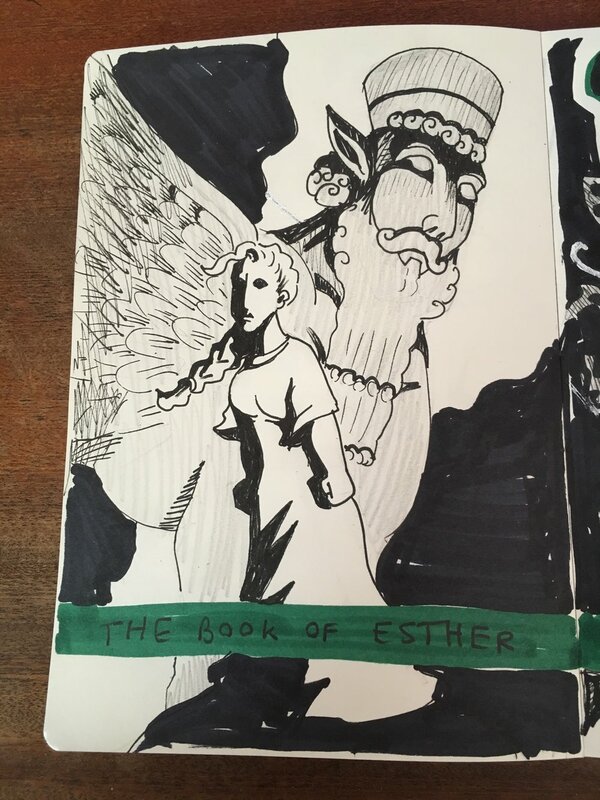 Here's an update on the progress on the Book of Esther, 40 comic pages are drawn of 65, (the other 15 pages are the introductory pages, covers and notes). We were very blessed that The Good Book company and Garners have taken up the series in their catalogues so that is an answer to prayer- Thank you for the prayer support! Please continue to pray for us to get more distribution deals and potentially the publisher we are talking to, which could take things to the next level. Also, we have scheduled in the next few years worth of Kickstarters and book launches as we think it would be good to Kickstart books in March/April and release the same book in September of the same year. This, however, means our finances need to stretch from now until next April without a Kickstarter. So, please pray for our financial provision until then as we are wholly dependant on the Lord in this.